Oh cool…it’s time for another SUO challenge! And boy, do we have an EASY theme for you this time … BUTTERFLIES! You all KNOW I LOVE dragonflies (hmm…maybe my blog banner gave that away – LOL!!!) But the next best thing to dragonflies is butterflies! And I have to say, the new Watercolor Wings set if just DELIGHTFUL!!! You pair it up with the Butterfly Framelits and the Bold Butterfly Framelits and what can I say…LOVE!!! In color Envelope dsp – Delight Dijon – 1 1/4 x 4 1/4, cut into banner on both sides, add to card front. Night of Navy – 1/8 x 4 1/4, ad to card front. Whisper White bottom butterfly – stamp solid in So Saffron, outside in Delightful Dijon, inside in Night of Navy, cut out with framelit. Whisper White THICK – CUT OUT details butterfloy first, then stamp using colors above, THEN add the body. 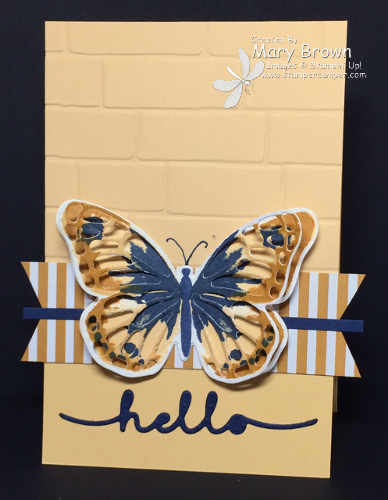 Layer onto bottom butterfly and add to card front. Night of Navy – cut out greeting and add to card front. This entry was posted in SUO Challenge and tagged Watercolor Wings. Bookmark the permalink. Stunning card. Your butterfly looks real. Thanks for sharing.